Planning a trip to Cancun this Christmas with your friends and family? The all-star city of Cancun is famous across the world for its innumerable activities and highly revered nightlife. Christmas time is here and we’re going to tell you all about the best ways to celebrate the holidays while on board your own private Cancun yacht charters! If you’ve planned your vacations to Cancun during the holidays, then you have picked the right time! The weather during December and January is ideal for fully enjoying your stay. SNORKELING IN COZUMEL – Hop on your private boat charter and set sail on the crystal clear water to head towards Cancun’s neighbor island – Cozumel. Cozumel is famous for its beautiful coral reef, making it a haven for divers and snorkelers worldwide. The reef areas of Cozumel are full of sea life and marine animals. Visit the most famous reefs in Cozumel — Palancar, Columbia and finally El Cielo and enjoy an abundance of multi-colored fish, coral reef formations and sea creatures. Crystal blue waters, shallow bathing areas and pure natural beauty in shallow water will give you the experience of your life. FISHING IN CANCUN – The diverse ecosystem of Cancun is home to a huge variety of fish which can be spotted in the surrounding fishing sites. Cancun fishing assures you an impressive catch according to the season. Anglers from across the world visit Mexico each year to enjoy Cancun sports fishing. While fishing you can spot and catch sailfish, marlin, yellow tail and many other trophy fish with a skilled team just waiting to provide you with a fishing adventure you won’t forget. Just being on the dazzling blue water is unforgettable, but with the best Cancun fishing charters and crews in Cancun, you will surely experience a truly legendary sport fishing time. EXPLORE ONE OF THE SEVEN WORLD WONDERS – Set out on a drive for 2hrs from Cancun to make your way towards Chichen-Itzá – one of the seven wonders of the world. Traveling to Chichen-Itzá can be a wonderful tour as you get to soak in the mesmerizing vistas of the lush green surroundings. You’ll see the ancient Mayan cities and its glorious architecture while there! The area of Chichen-Itzá area provides an interesting view of what traditional Mayan design and other Mexican cultures featured in their cities. This sacred site was one of the greatest Mayan centers of the Yucatán peninsula. DIVE IN THE MUSA CANCUN UNDERWATER MUSEUM – The Cancun Underwater Museum is the most famous underwater sculpture museum across the world. Scuba dive in this incredible place devoted to the conservation of the area. Enjoy diving in the Cancun Underwater Museum (MUSA) and check out over 470 underwater statues. Some of the figures are now covered with algae while others have some beautiful reef formations. This all has made the facial features distorted and eerie looking. The underwater museum Cancun is one of a kind. It is a haven for a large variety of fish. Diving here should not be missed during your vacation. A DAY TRIP TO ISLA MUJERES – This island is one of the best places in the area surrounding Cancun. Hop on a private luxurious yacht and visit this beautiful island – one of its kind. explore small streets lined with shops and restaurants while keeping an eye out for whimsical and quirky sights. Visitors can also sign up for snorkeling excursions. Guests can swim in the beautiful blue ocean, kayak, snorkel, bike, try the zip-line at Garrafon Natural Reef Park. At Punta Sur, the visitors can enjoy panoramic views of the scenic dramatic cliffs and turquoise sea. Do not forget to explore this elegant sculpture garden. 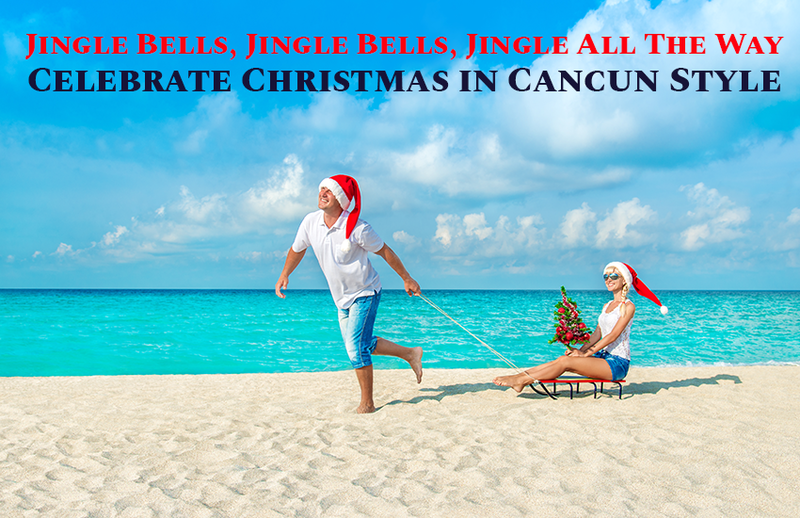 There are too many ways to celebrate Christmas in Cancun. However, your own private cruise is the best option! Cancun fishing charters will help you enjoy world-class fishing, and you can also be part of the ongoing Christmas activities aboard your own private yacht and collect your gifts from Santa. Enjoy the live music performance and sip on the freshly brewed beer along with admiring the beauty of the night sky. Cancun is one of the best places to celebrate Christmas with your family and friends on board a private yacht charter.